Donald Trump Jr., along with Jared Kushner and then-campaign manager Paul Manafort, held a meeting with a Russian lawyer at Trump Tower last year in hopes of learning damning information about Hillary Clinton’s campaign. The New York Times first reported the previously undisclosed meeting on Saturday, though it was only Sunday that it became clear the discussion with Natalia Veselnitskaya was arranged explicitly to help Trump’s campaign. Donald Trump Jr. has released two utterly contradictory statements over the course of just 24 hours. The first claims that they “primarily discussed a program about the adoption of Russian children.” But the second statement careens wildly away from that, with a full admission that the purpose of the meeting was to obtain damaging information about Hillary Clinton. What? Mark Corallo, a spokesman for the president’s legal team, told Politico that the president was not aware of the meeting. No word yet on what sort of burger Priebus considers the meeting now. 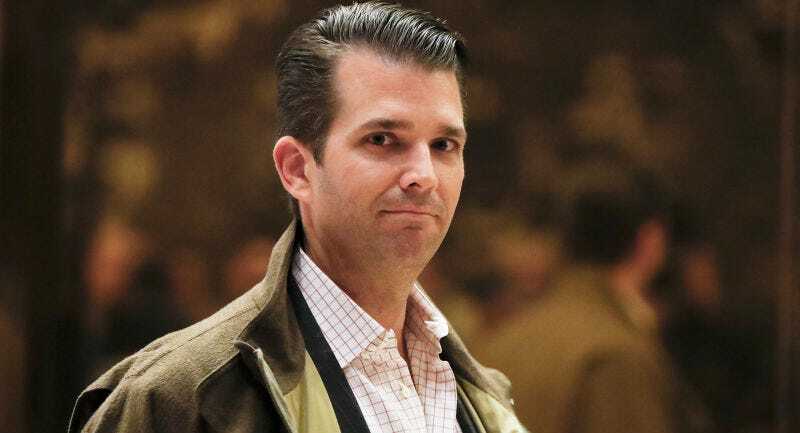 Veselnitskaya, who was introduced to Trump Jr. via an acquaintance from the 2013 Miss Universe pageant in Moscow, said in a statement on Saturday that “nothing at all about the presidential campaign” was discussed at the Trump Tower meeting. This story will be updated with more information as it’s released.